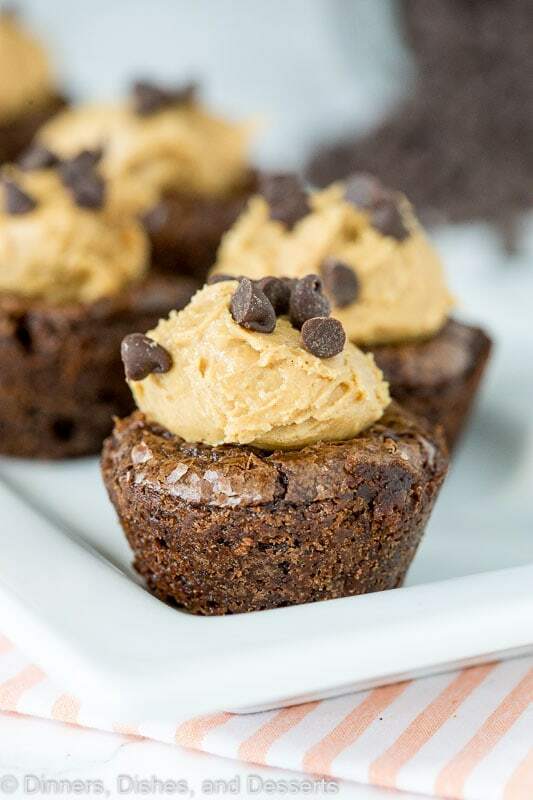 Peanut Butter Brownie Bites – fudgy brownies baked in mini muffin tins and then filled with a creamy peanut butter mixture. Perfect bite to cure your sweet tooth! Brownies are my ultimate weakness. If you have been here before, I am sure you know this. 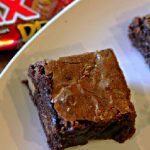 There are close to 40 brownie recipes on the blog. And a handful of them have peanut butter involved. 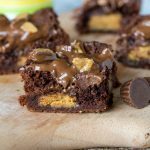 Peanut Butter Stuffed Brownies might be my biggest downfall. When I was growing up, pretty much every weekend we would have dessert. It would either be these Chocolate Chip Cookies or homemade brownies. The same recipe for both, all of the time. And to this day, I still have them both memorized because I have made them so many times. 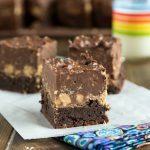 So another chocolate and peanut butter recipe, that involves brownie shouldn’t come as a huge surprise to anyone. These first appeared on the blog almost 6 year ago. So today they are getting a little face lift. Plus, I am pretty sure no one has laid eyes on the recipe in years, and that is just no OK. They are too good not to be made. 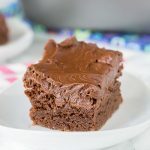 You can use your favorite box mix brownies to make this, or you can use this super easy fudgy brownie recipe. Either is totally fine. The magic really happens with the peanut butter mixture. It is super thick, creamy, and kind of like the center of a Reese’s peanut butter cup. 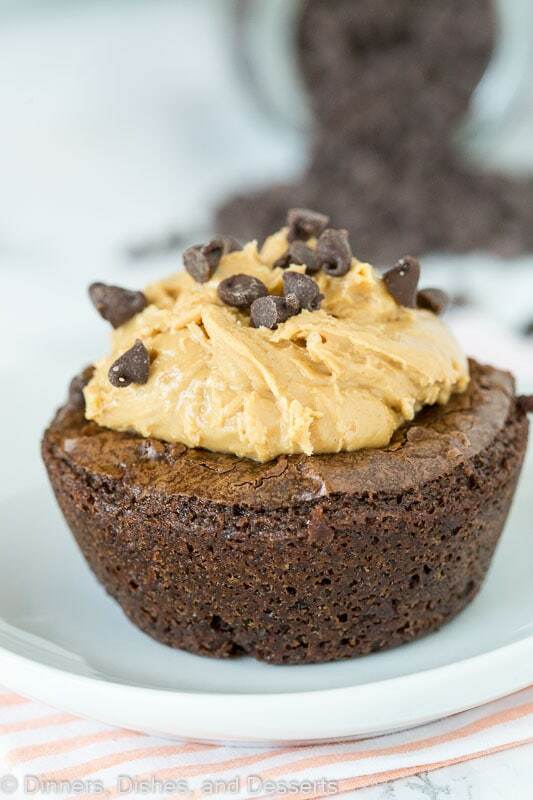 I made these in a mini muffin tin, because with the peanut butter they are definitely super rich; and a little bite is all you need. But if you want to go all out, make a few in a regular size muffin tin. You just might want to have someone around to share it with. Or not. That is totally up to you! 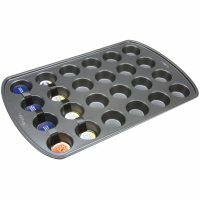 Mini Muffin Tins – make bite size treats with these cute little muffin tins. Great for muffins, cupcakes, or even brownies! Measuring Spoons – I have to have a metal set of measuring spoons on hand. These OXO ones have magnets in the handles, so they always stay together. 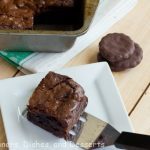 Peanut Butter Brownie Bites - fudgy brownies baked in mini muffin tins and then filled with a creamy peanut butter mixture. Perfect bite to cure your sweet tooth! Preheat oven to 350 degrees. Grease mini muffin tins very well. 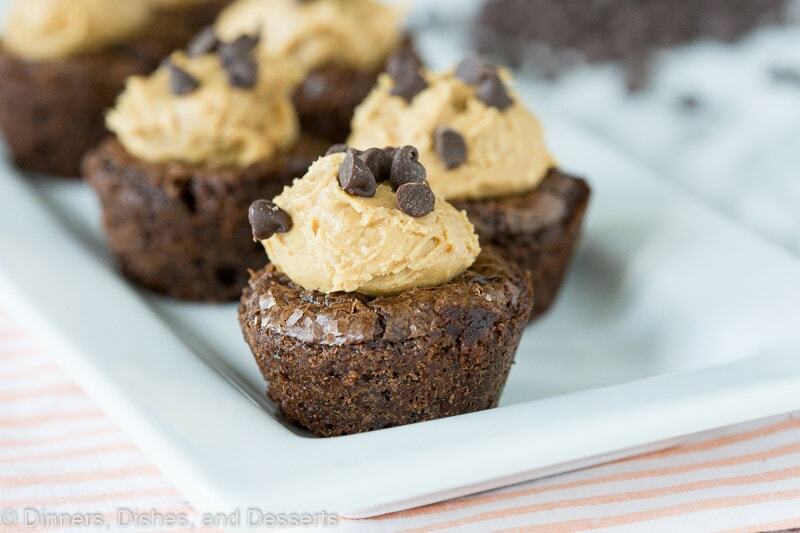 Fill muffin tins with brownie batter. Bake for 10 minutes. The centers should cave in a little once you remove from the oven. Allow to cool completely. Mix together peanut butter, sugar, butter and vanilla until smooth. Fill center of brownies with 1 heaping teaspoon of the peanut butter mixture. Top with a few chocolate chips. 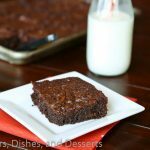 Here is a great recipe for Homemade Fudgy Brownies to use in this recipe. These gems does look like a tasty treat, who doesn’t like peanut butter and chocolate?! The extra bonus is that they do not take all day in the kitchen to make. Definitely something we are all looking for in this hectic time of the upcoming holidays. Well done-yum! I am so happy you found my blog as it led me to yours! Your food is my kind of food and I like you on Facebook so that I won’t miss your posts. 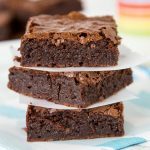 These brownies look delicious; anything with PB is great so I know your brownies are too! I can tell you are a great mommy for your little guy and show him a lot of love through your cooking and all. I’ve been looking around and see lots of great recipes here and I have them bookmarked. Thanks again for stopping by—I love your blog!!!! How funny! I made almost the exact same things a year ago today. The only reason I know is because I now put a link to my “one year ago” posts lol. They look so good! Oh man I wish I got afternoon snacks like that! They look delicious!! Awww, how cool of you to bake something on request like that! I think it’s fun that you guys cruised pinterest together for an idea. I limit myself to a very short amount of time on that site. You can dig yourself into a hole that’s so deep there’s no tomorrow. Your brownie bites are delectable. I’m hiding the picture from Hubby. If he walks through and see them, he’ll want them. Oh my goodness you know how much I love peanut butter…this looks SO good! Mmmmmmm…..amazing!!! You make the best chocolate-peanut butter treats! Delicious, Erin! Perfect combo and great for a last-minute dessert need! My entire family would dive into this lovely chocolate treat. You know I love some peanut butter and chocolate. Mmmmmm! Looks yummy Erin! Even with my not being too hot on PB, I DO love it when it’s with chocolate so this may end up on my Christmas cookie tray! Ok, will DSS (dept of social services) come take me away if I start hoping my kid gets to be home sick soon too? I bet this was better than any medicine, lol. 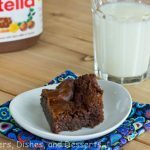 These look so great and were a great treat to make for your son! YUM! I know what you mean! I look at pinterest and gain weight just by clicking “PIN”! Love pintrest! I have so many new recipes to try thanks to that site. What a nice way to spend an afternoon off of school! 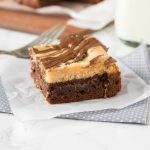 The brownie bites are so cute and I’m really loving the look of your blog! Pinterest can be a dangerous place!!! These look divine. Mmmm! Your son has excellent taste! These look fabulous 🙂 Buzzed! These look delicious! Pb+Chocolate=perfect dessert! I am addicted to Pinterest too. Congrats on the top 9! I’d eat these up in no time. P.B. and chocolate? Sign me up for sure! These are bites though…so they are small and perfectly alright to snack on. 🙂 I am a bad influence, I know. 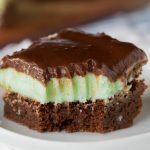 These are so delicious, I have to make them again for the holidays! When if comes to pb and chocolate, built in portion control is needed! These were perfect to assuage my cravings! So perfect for game day but you better make a double batch! These are so cute and taste amazing! 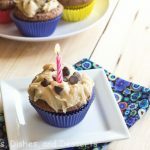 The peanut butter and chocolate are perfect together, and I love how fluffy the PB frosting is. This looks really good! Would love to grab one right now! I love these delicious little bites! Pinning! I love this flavor combination! Did someone say PEANUT BUTTER? These look SO SO good! 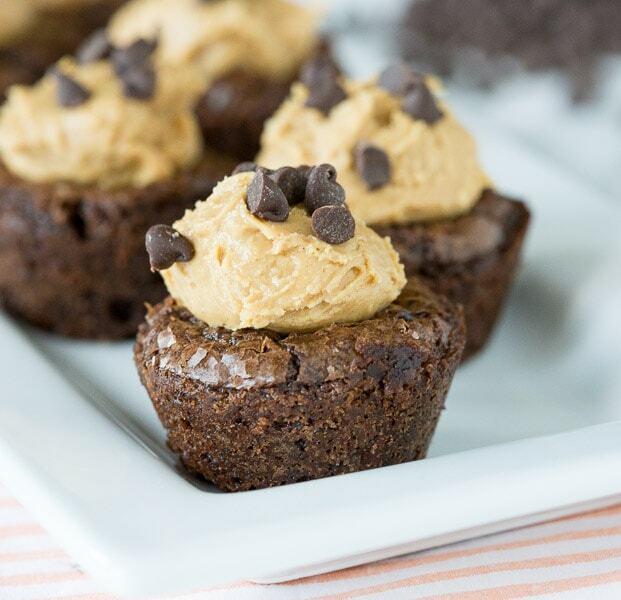 Heck to the yes on these peanut butter brownie bites. Best flavor combination ever! Those look like little bites of heaven! I love peanut butter and chocolate together! Then you add the brownie! Oh my! 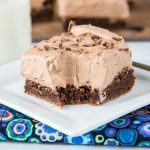 These brownie bites look irresistible! So fun to make too! These look so delicious! Love how packed with peanut butter they are! Awe! Seriously these are mouth watering, looks absolutely delicious! Two of my favorite things, peanut butter and brownies!! Yum! You nailed it with these! The best kind of dessert. These would be dangerous around me! You have outdone yourself with these!